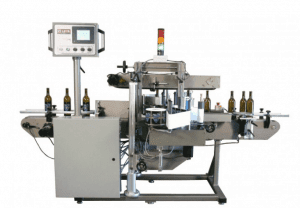 The Labeler Model 1500 NR is designed to apply front and back labels to non-round and round bottles at speeds up to 150 bpm. Label placement accuracy is maintained within ±1/32”. 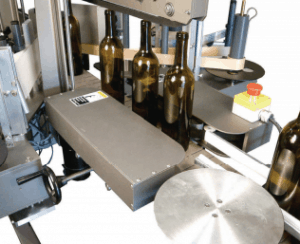 By adding our Wrap Station Assembly the 1500 NR can also apply single wrap labels to round bottles. Conveyor speeds and label application are controlled through the use of state-of-the-art PLC controls and stepper motors. A Touchscreen Operator Interface insures ease of operation and convenience. All aluminum parts are coated with a durable “steel-it” stainless coating that is chip and scratch resistant. The labeler model 1500NR has been designed for ease of use and consumer convenience. It comes with a self-teaching label gap sensor that makes set up uncomplicated and trouble free. Our new pinch grip design simplifies the way the web is threaded through the machine. Aircraft grade aluminum and stainless steel (where applicable) are utilized in construction for durability and wear. Designed for 1” to 6” diameter and 14” tall containers. Labels sizes from 1” to 6” tall and 14” in length. Accepts random bottle feeding or continuous production. Changeovers require no tools and take less than 15 minutes. PLC motion controls with Touch Screen Interface. Speeds up to 150 bpm depending on label length. Extra Tall Label Kit for labels up to 7 ½ tall. 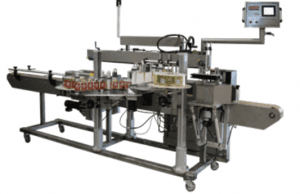 Wrap Station permits labeling of round containers with a single label. Neck Label Kit to apply neck labels to round containers. Conveyor speeds and label application are controlled through the use of state-of-the-art PLC controls and stepper motors. A Touchscreen Operator Interface insures ease of operation and convenience. It comes with a self-teaching label gap sensor that makes set up uncomplicated and trouble free. Our new pinch grip design simplifies the way the web is threaded through the machine. 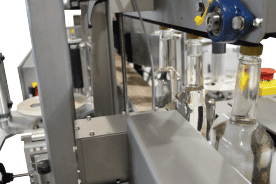 By adding our Wrap Station Assembly the 1500NW can also apply single wrap labels to round bottles. Conveyor speeds and label application are controlled through the use of state-of-the-art PLC controls and stepper motors. A Touchscreen Operator Interface insures ease of operation and convenience. The model 1500NW has been designed for ease of use and consumer convenience. It comes with a self-teaching label gap sensor that makes set up uncomplicated and trouble free. Our new pinch grip design simplifies the way the web is threaded through the machine. Aircraft grade aluminum and stainless steel (where applicable) are utilized in construction for durability and wear. All aluminum parts are coated with a durable “steel-it” stainless coating that is chip and scratch resistant. Changeovers require no tools and take less than 15 minutes. PLC motion controls with Touch Screen Interface. Speeds up to 150 bpm depending on label length.